I love audiophiles. They spend $20,000 on a high end speaker system with zero flibber and low Db to THD levels (at least that’s what it sounds like they’re telling you) and then they slap on a gold remaster of a Macy Gray album and say “Can you hear the gravel in her voice?” It’s like buying a Ferrari just to slip Frankie Goes To Hollywood into the CD player and then sit in the driveway for an hour. I love me some classics, but not that much. Anyway, this is an “audiophile-grade” WAV player made of wood and gold and plays only the fanciest, high-quality WAV files. It has an RCA interface so you can hook it up to your stereo and a 6.3mm headphone jack that includes a 13.3 mW amp. 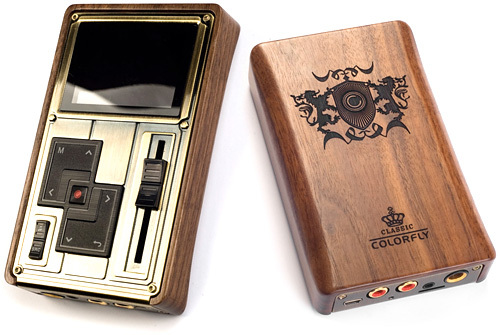 It’s called the Colorfly Pocket HiFi C4 Pro and costs $800 on Amazon and should make your Fleetwood Mac rips sound like Stevie Nicks is sitting on your neck singing into your ear.